The central government on Friday asked the luxury industry to recognise the work of Indian artisans and help them access markets outside the country. "It pains me to say this. 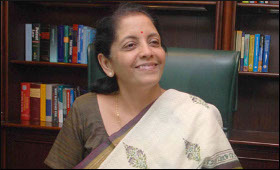 I purposely say this to this audience...the luxury industry will have to identify them (artisans) from various pockets in India and give them their due recognition," Commerce Minister Nirmala Sitharaman said at the Luxury Symposium 2017 here. The symposium was organised by the government in association with Taj Hotels, Palaces, Resorts and Safaris. France is the country partner for this edition of the event. "It is possible for the luxury industry to promote products of artisans, who need recognition, and this industry today is well poised to bridge the gap between artisans and market," she said. The minister said the luxury industry is rapidly growing in India and, according to a study, the sector would be worth $100 billion in eight years, as compared to the current seven-eight billion dollars. "We need to put in lot of attention for this sector and facilitate and ensure that it really fits into Make in India," she said. "The possibility of the luxury industry to survive and grow sufficiently in India is there because of its aspirational class," she added. In this connection, Sitharaman pointed out that the number of high networth individuals is growing in India, and the country will account for about six per cent of all billionaires in the next five years.